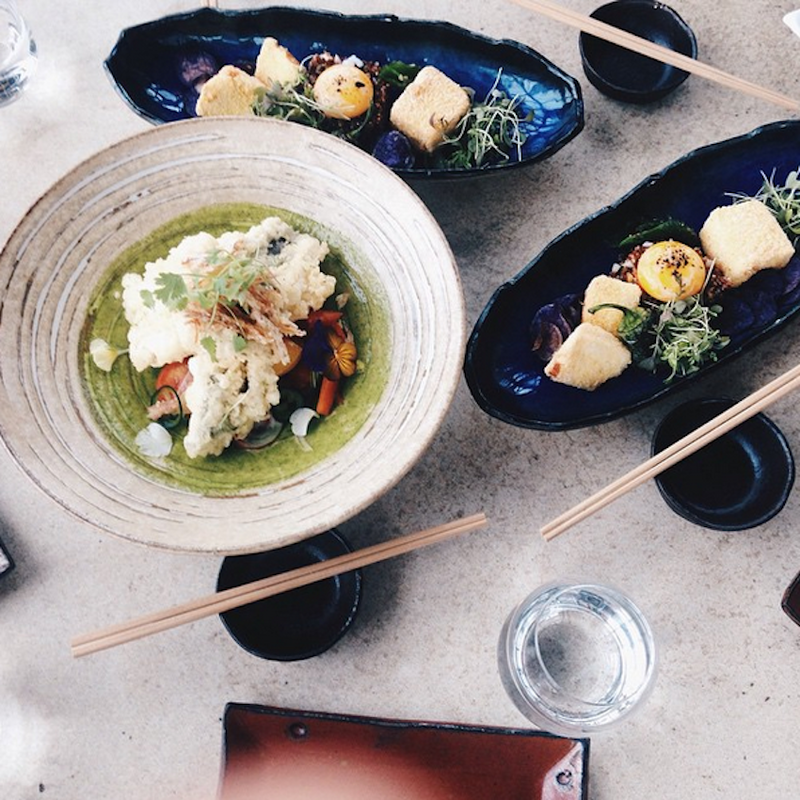 SUSHISAMBA || FOOD REVIEW | RAWR BOWS. One of the things I love the most about London is the huge variety of restaurants it offers. From fast-food chains to Michelin-star posh restaurants. Since I like to eat good food whilst keeping my bank account happy I usually go for what's in-between, places like Ping Pong, Wagamama's, Chiquitos and Wahaca are some of my go-to places when I don't feel like cooking. A while back, before going back home for the summer and with the excuse of one of my friends switching unis, we decided to go somewhere fancier and splurge a bit so we went to the famous Sushisamba. 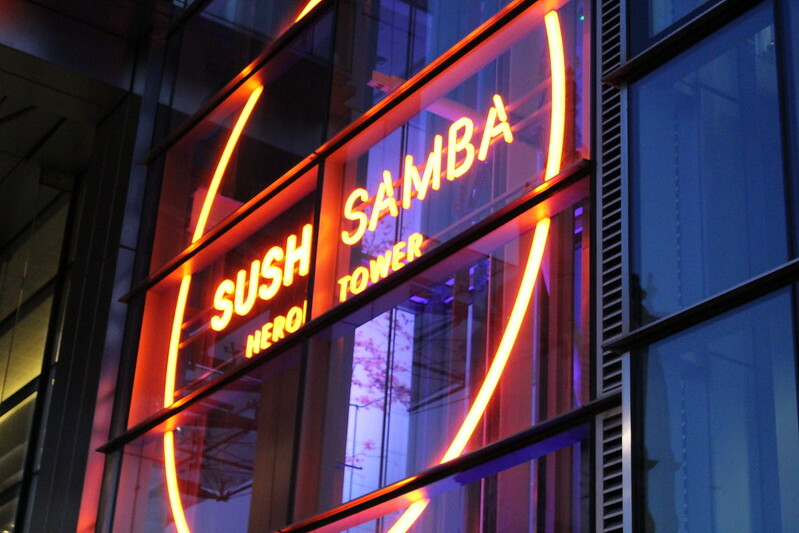 Sushisamba's dishes are the delicious result of a blend of Japanese, Brazilian and Peruvian cuisine and culture. The first restaurant was opened in New York (West Village) and now it can also be found in London (Heron Tower), Miami Beach, Las Vegas and Coral Gables. I went to the one in London, which is located on the 38th floor of the Heron Tower so it offers breath-taking views of the city and it's surrounded by London's most famous skyscrapers. The venue itself is also stunning, with hundreds of lightbulbs hanging from the ceiling that give the area a vintage yet modern vibe. The staff were super friendly and took their time to explain us some dishes from the menu. Now onto the important bit, the food. I ordered the Sea Bass Tempura with heritage tomatoes and beetroot seviche, aji verde and lime (£24). It was absolutely delicious, the fish was super moist and tender and the tempura was lightweight and not too oily. It came with some veggies that were equally stunning and a sauce that was too die for. The only downside was the portion size. I shared the dish with a friend since it was under the 'large plates' section and neither of us was too hungry. I wasn't left hungry and besides not being that 'large' it was enough to fill me up. However, if you are hungry when you go there I would suggest getting one of their 'large plates' to yourself or sharing some smaller plates. My friends got the Tofu Corn-coated with red quinoa salad, peruvian potato chips and slow cooked egg yolk (£15.50) which looked pretty good but again, the portion size was on the smaller side. Overall, I would recommend this restaurant for a special occasion when you are willing to spend a bit more - the food is really really good!